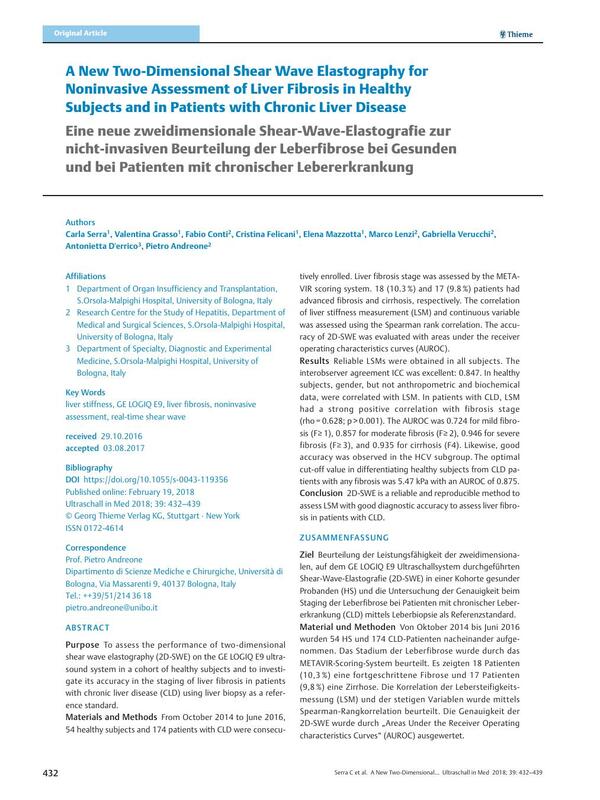 Purpose To assess the performance of two-dimensional shear wave elastography (2D-SWE) on the GE LOGIQ E9 ultrasound system in a cohort of healthy subjects and to investigate its accuracy in the staging of liver fibrosis in patients with chronic liver disease (CLD) using liver biopsy as a reference standard. Materials and Methods From October 2014 to June 2016, 54 healthy subjects and 174 patients with CLD were consecutively enrolled. Liver fibrosis stage was assessed by the METAVIR scoring system. 18 (10.3 %) and 17 (9.8 %) patients had advanced fibrosis and cirrhosis, respectively. The correlation of liver stiffness measurement (LSM) and continuous variable was assessed using the Spearman rank correlation. The accuracy of 2D-SWE was evaluated with areas under the receiver operating characteristics curves (AUROC). Results Reliable LSMs were obtained in all subjects. The interobserver agreement ICC was excellent: 0.847. In healthy subjects, gender, but not anthropometric and biochemical data, were correlated with LSM. In patients with CLD, LSM had a strong positive correlation with fibrosis stage (rho = 0.628; p > 0.001). The AUROC was 0.724 for mild fibrosis (F≥ 1), 0.857 for moderate fibrosis (F≥ 2), 0.946 for severe fibrosis (F≥ 3), and 0.935 for cirrhosis (F4). Likewise, good accuracy was observed in the HCV subgroup. The optimal cut-off value in differentiating healthy subjects from CLD patients with any fibrosis was 5.47 kPa with an AUROC of 0.875. Conclusion 2D-SWE is a reliable and reproducible method to assess LSM with good diagnostic accuracy to assess liver fibrosis in patients with CLD. Ziel Beurteilung der Leistungsfähigkeit der zweidimensionalen, auf dem GE LOGIQ E9 Ultraschallsystem durchgeführten Shear-Wave-Elastografie (2D-SWE) in einer Kohorte gesunder Probanden (HS) und die Untersuchung der Genauigkeit beim Staging der Leberfibrose bei Patienten mit chronischer Lebererkrankung (CLD) mittels Leberbiopsie als Referenzstandard. Material und Methoden Von Oktober 2014 bis Juni 2016 wurden 54 HS und 174 CLD-Patienten nacheinander aufgenommen. Das Stadium der Leberfibrose wurde durch das METAVIR-Scoring-System beurteilt. Es zeigten 18 Patienten (10,3 %) eine fortgeschrittene Fibrose und 17 Patienten (9,8 %) eine Zirrhose. Die Korrelation der Lebersteifigkeitsmessung (LSM) und der stetigen Variablen wurde mittels Spearman-Rangkorrelation beurteilt. Die Genauigkeit der 2D-SWE wurde durch „Areas Under the Receiver Operating characteristics Curves“ (AUROC) ausgewertet. Ergebnisse Eine verlässliche LSM wurden bei allen Probanden erzielt. Die Inter-Observer-Übereinstimmung (ICC) war mit 0,847 hervorragend. In HS waren geschlechtsspezifische, nicht aber anthropometrische und biochemische Daten, mit der LSM korreliert. Bei CLD-Patienten zeigte die LSM eine signifikante positive Korrelation mit dem Fibrose-Stadium (rho = 0,628; p > 0,001). Die AUROC betrug 0,724 bei milder Fibrose (F≥ 1), 0,857 bei moderater Fibrose (F≥ 2), 0,946 bei schwerer Fibrose (F≥ 3) und 0,935 bei Zirrhose (F4). Ebenso wurde in der HCV-Untergruppe eine hohe Genauigkeit beobachtet. Der optimale Grenzwert für die Differenzierung der HS von den CLD-Patienten mit jeglicher Fibrose betrug 5,47 kPa bei einer AUROC von 0,875. Schlussfolgerung Die 2D-SWE ist eine verlässige und reproduzierbare Methode zur LSM, um mit hoher diagnostischer Treffsicherheit die Leberfibrose bei CLD-Patienten zu beurteilen. 28 European Association for the Study of the Liver. EASL Recommendations on Treatment of Hepatitis C 2016. J Hepatol 2016 [Epub ahead of print].